Gunner Kishore Kumar Munna hailed from Barmaha Village of Khagaria district in Bihar. Son of Shri Nageshwar Yadav and Smt Tolu Devi, Gnr Kishor Kumar was the youngest among three siblings. He had joined the Indian Army in the year 2013 at a very young age and was inducted into 278 Field Regiment. 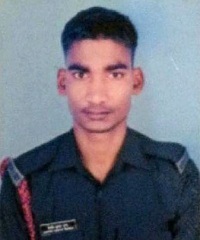 After completing his training Gnr Kishor Kumar got posted to his unit that was deployed in Jammu’s Poonch sector. India shares a 3,323-km border with Pakistan, of which 221 km of the IB and 740 km of the LoC fall in Jammu and Kashmir. The LoC is highly active and volatile where cease fire violations occur very often and without any warning. The year 2017, recorded the highest number of ceasefire violations in the past decade resulting in the death of 35 people, including 19 army personnel and four BSF men. In another case of cease fire violation, Pakistani troops opened unprovoked fire in Poonch sector along the LoC on 04 Feb 2018. On 04 Feb 2018, around at 3 pm Pakistan Army troops initiated unprovoked firing on Indian posts from across the border in Poonch sector. During that period Gnr Munna’s unit, 278 Field Regiment was deployed in the forward area along the Line of control in Poonch sector. The Pakistani troops violated the ceasefire and resorted to heavy cross border shelling of various Indian Army posts and civilian areas. In this heavy shelling, More than 21 people were killed on Line of Control (LoC) and more than 50 people suffered injuries and over 50,000 people fled their homes in that sector. Indian army responded in a befitting manner to the Pakistani aggression and consequently a heavy exchange of fire ensued thereafter lasting for several hours. However, during this cross border shelling Gnr Kishore Kumar Munna got severely injured by shelling splinters. He was immediately evacuated to command military hospital in Udhamur for specialized treatment. 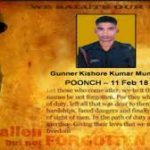 However Gnr Kishore Kumar lost the battle for life in the hospital and succumbed to his injuries on 11 Feb 2018. 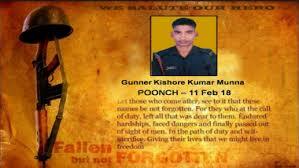 Gnr Kishore Kumar was a valiant and committed soldier who laid down his life in the service of the nation. Gnr Kishore Kumar is survived by his father Shri Nageshwar Yadav and mother Tolu Devi. A big Salute to great army person. All Indian will always remembered you. Jai Hind . My deepest respects to you and your family..Jai Hind..!